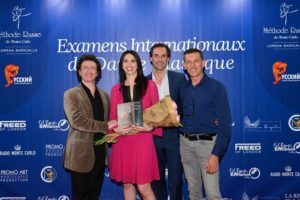 A weekend dedicated to young dance talents has animated Monte-Carlo for the annual event of the International Exams of the ‘Méthode Russe de Monte Carlo de Lorena Baricalla’ held in the prestigious Prince Rainier III Auditorium, home of the Philharmonic Orchestra, in the presence of leading figures from the world of dance, art and culture. The event was created in association with the Russian Cultural Centre of Monaco and was organized by PromoArt Montecarlo Production. A selection of over 100 candidates from the 11 schools currently affiliated to the Method in Italy and France have participated at the event. Master Classes with ballet star Lorena Baricalla and the young dancers took place on the first day while the second day has been dedicated to the International Exams of the “Method” followed by a short show with all the participants. The ballet classes on Saturday and Sunday have been accompanied at the piano by Patricia Krawczynska and Imelda Cartwright, pianists of the Ballets of Monte-Carlo. This year, together with Lorena Baricalla joined the Jury: the étoile Jozef Varga, who is now performing in classical roles such as “Sleeping Beauty” and “Giselle” and in the modern repertoire at the Het National Ballet for the shows produced by PromoArt Monte-Carlo; and the principal dancer and choreographer Toni Candeloro, guest in international companies such as the Cuba Ballet and the Zurich Opera, partner of C. Fracci, L. Savignano and A. Ferri. As well, Candeloro is a specialist of Ballet Russes repertoire and he owns one of the most important ballet-related collections that has been exhibited at the Russian Art Museum in Saint Petersburg, at the Venice Museum, at the Scala of Milano Museum, etc. Candeloro is also Artistic Director of the “Mikhail Fokine Association”. We had the attendance of Natalia Bereza, President of the Russian Cultural Centre in Monaco and representative at this event of Her Excellency Ekaterina Semenikhina, the Honorary Russian Consul in the Principality, Alisson Irien de Augustinis, General Secretary of the Russian Cultural Centre in Monaco and His Excellency Cristiano Gallo, Italian Ambassador in the Principality of Monaco. An Honorary Committee attended, made up of international artists and well-known figures: Marcos Marin, artist of the Prince Albert II of Monaco Foundation; Serge Liagre, Founder of the “Villa Rosemaine” Haute Couture Vintage Collection; Marketa Hakkinen, fashion designer who has participated in the recent Fashion Weeks in New York, Los Angeles, Paris, and who is the wife of the Formula1 racing driver Mika Hakkinen; artistic agent Martial Benhamou; Fashion PR Francesca Fortini from Milano; painter Doune Roux, from Paris, wife of French singer Corbier; painter Laetitia Duviviez, from Monaco; Krissy Pesciglione-Cuni, CEO of Opportunity, the Principality of Monaco’s social network. An event full of intense emotions during which 11 scholarships were given to the most deserving dancers of the affiliated schools and a tribute has been made on stage to choreographer Marius Petipa, creator of the ballets of the Russian repertoire such as Swan Lake, Sleeping Beauty, The Nutcracker. Lorena, how much has changed, and so how much has the dance evolved in terms of technique and styles, compared to when did you start your career? There is always an evolution and it is important that we evolve with the times we live. This knowing how to renew must be part of being an artist. But not everyone is always able to understand it. I would say that today we dance in a more athletic way and therefore I have looked for a more dynamic use on the muscular level. For this reason I have developed a type of daily training for myself and for the young people who follow my “Méthode”. However, there is currently a big risk. Increasingly, acrobatics and gymnastics are being confused with dance. Dance is and must remain art, and art is emotion, it means being an interpreter. Few are real artists. It was unfortunately already in the past, but now I would say more and more. We must defend what is the true essence of dance. And I was defending it long ago as well as I defend it now. We talk about the passing time and consequently the changing fashions, always in a professional context. Are there any works that today are represented less than others? The repertoire has expanded through all the works of the current choreographers which are made. The classic nineteenth-century repertoire remains timeless but few companies represent it or are able to represent it also for the scenic costs and costumes that this entails. However, it remains an excellent basis for study for young people. In general the companies have a mixed repertoire from Balanchine to more modern choreographers. Some represent only the works of the choreographers who direct them. As for me, being a choreographer, I generally interpret my works. My style could be called a modern neo-classic. I love dancing and I do dancing the ballet companies with pointed shoes, I use fluid movements with a constant aesthetic research. It is fundamental for me to express emotions through the interpretation of the character, which can be narrative or abstract. For me dance is art, and must represent energy and beauty. Has the crisis involved the classical dance world in any way? Obviously, unfortunately the dance and the entertainment world in general need budgets to support costs and pay professionals. So the crisis certainly does not help. You created the “Méthode Russe de Monte-Carlo de Lorena Baricalla”, but how did this desire to teach young people come about? Actually all this was born a long time ago, and has always been a part of me. I started teaching that I was 14 years old. My mother had and still has a dance school and I have always followed the students and often given master classes for other schools. Also having created my own dance company through our production company PromoArt Monte-Carlo Production, I have always worked with other professionals and young dancers. For example, more than 120 students from the Princesse Grace of Monaco Academy have worked in our shows and in my choreographies. This means that for a long time I have always trained others besides myself. The Méthode is therefore a pedagogical ability that I built during my life and does not want to be just a set of academic rules. This would be extremely trivial. Many suppose that it is enough to do some exercises. I have been collecting my experience for 2 years, calling it “Méthode Russe de Monte-Carlo de Lorena Baricalla” simply to identify the project I wish to pursue today to support young dancers and ballet schools. The Méthode is a vision. It is the approach, it is the way of teaching and explaining things. This makes the difference. I work on 3 levels: the body and therefore, for example, the mechanics of the skeleton and the muscular dynamics, the mind and that is, for example, the mental visualization, the psychological approach of the student, and the soul and therefore the development of being an artist and of individual personality. All this is achieved through the various lessons during the Master’s training courses of the ‘Méthode’ throughout the year for both students and teachers. In addition, the educational program also offers the annual examination steps that bring together all the technical and artistic difficulties for the 14 training levels that I have structured. In your path you have also done things different from dance, you are singer, actress, choreographer, writer, testimonial for fashion brands,…what have you learned from these different realities? And would you recommend it to young dancers? Of course, for me being an artist means expressing and being eclectic and this is the message that I give to young people. It means creating, renewing, testing oneself, learning new things every day, exchanging experiences with others. The ability to express a talent always passes through dedication to art and study. You do not improvise. This is why the Mentis form and the approach to doing things are important and this is something that should be built since an early age. A mantra or a motto that you want to gift to those who dream of having a career like yours?